Hello people of the internet!!! On today’s ‘Monday Memos’ we’re going to talk about an AMAZING new book coming out on January 22, 2019. 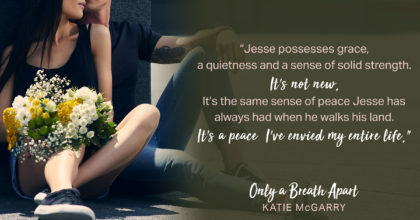 If you’re addicted to YA (Young Adult Fiction) then you’ll love Katie McGarry’s latest release ‘Only A Breath Apart’. Today I have an incredible excerpt for y’all in order to get you ready for the release. Now let’s get to the excerpt! Ready? Ok, let’s go! All photos and information used in this blog belong to Katie McGarry, Tor Teen, katiemcgarry.com, Twitter, Facebook, Goodreads, Pinterest, Tumblr, Instagram, all companies, individuals, corporations, managers, writers, producers, authors, publishers, and/or businesses that should receive credit for any book(s), mentioned in this blog post, all of the and all companies, individuals, corporations, managers, writers, producers, and/or businesses that should receive credit for anything mentioned in this blog post, and all original owners. I do not own anything in this blog. If any people, corporations, businesses, companies, etc, were not previously given credit for their work, they are given credit now and their previous absence was unintentional. All opinions expressed in this blog are my own. I wrote this blog for entertainment purposes and no copyright infringement is intended. 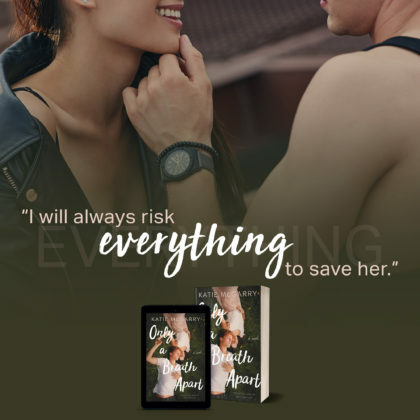 celindareyesblog January 22, 2019 No Comments on Monday Memos: Excerpt from Katie McGarry’s newest YA book ‘Only A Breath Apart’. Category: Excerpt Reveal, Monday Memos. Tagged: 2019, book, excerpt, facebook, Goodreads, instagram, Katie McGarry, katiemcgarry.com, monday memos, new, pinterest, review, Tor Teen, tumblr, twitter, YA. 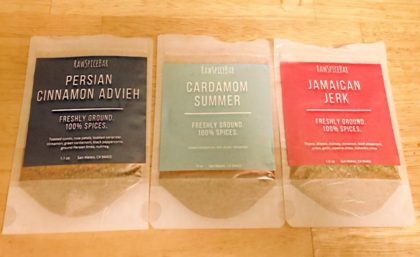 Monday Memos: RAWSPICEBAR Review…the perfect way to add a little spice to your new year! Home | Monday Memos | Monday Memos: RAWSPICEBAR Review…the perfect way to add a little spice to your new year! Hello people of the internet!!! On today’s ‘Monday Memos’ we once again have the opportunity to work with the spice subscription company Rawspicebar. So if you didn’t quite find that perfect Christmas present for the chef in your family, or if you want to give yourself a late Christmas present then please read on. Full disclosure, I was given this product to try for free, however as always this will not affect my opinions on the product itself. Ready? Ok? This service allows you to order customizable spice subscriptions based off of your diet, favorite ingredients to cook with, the number of people you generally cook for, among other factors. This info allows you to get 3 custom picked spices that you can order monthly, quarterly, or every 6 months. So how much does this AMAZING service cost? You can get your 1st of 3 spices for only $9, or buy individual spices for $7 a spice (quantity is 1oz per spice). You can also join Rawspicebar’s ‘Spice of the Month Club’, which gives you 2 spices every month for $36 for 3 months, $72 for 6 months, or $144 for a 1 year subscription. Honestly the Rawspicebar website is so HUGE & full of lots of fun gift ideas for the entire year! They have special sets for birthdays, weddings, graduation gifts, & so much more! On the website you’ll also find recipes & spice guides in order to help you with all your future culinary adventures! • All photos and information used in this blog belong Raw Spice Bar, Twitter, Facebook, Instagram, Pinterest, and all other original owners. I do not own anything in this blog. If any people, corporations, businesses, companies, etc, were not previously given credit for their work, they are given credit now and their previous absence was unintentional. All opinions expressed in this blog are my own. I wrote this blog for entertainment purposes and no copyright infringement is intended., and all other original owners. I do not own anything in this blog. If any people, corporations, businesses, companies, etc, were not previously given credit for their work, they are given credit now and their previous absence was unintentional. All opinions expressed in this blog are my own. I wrote this blog for entertainment purposes and no copyright infringement is intended. celindareyesblog December 27, 2018 No Comments on Monday Memos: RAWSPICEBAR Review…the perfect way to add a little spice to your new year!. Category: Monday Memos. Tagged: 2018, 2019, Chef, christmas, collab, Cook, Fest, food, fun, holiday, Kit, new, new years, RawSpiceBar, review, season, spice, subscription, thanksgiving. Hello people of the internet!!! On today’s ‘ Monday Memos’ we’re going to discuss a book called ‘Follow Me Back’, a psychological thriller that will definitely find a place among your TBR pile (or To Be Read for those of you who don’t speak BookTube) very soon. ‘Follow Me Back’ is the debut book from A.V. Geiger, one of the latest superstars to come out of the writing website Wattpad, and was provided for review by Sourcebooks Fire. On the outside this book seems like your typical Young Adult contemporary novel, but it quickly evolves into a story that will keep you mesmerized until the end. So now that you’re excited, let’s begin the review! Ready? Ok, let’s go!!! 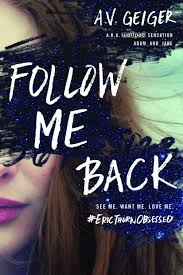 ‘Follow Me Back’ is a dual perspective novel that tells the story of 18 year old Tessa Hart who is a super fan of musician Eric Thorne. Tessa become famous within the Eric Thorne fandom when her fanfiction ‘Eric Thorne Obsessed’ goes viral. Due to her newfound internet fame, Tessa grabs the attention of fellow super fan MET (a screen name that stands for Mrs. Eric Thorne), as well as Eric’s management team. However, Tessa is harboring a deep secret that will eventually change her life forever. We also get insight into 18 year old superstar Eric’s deep resentment of his extreme fame, due to the fact that his fans seem to be more interested in his body than his music. When Eric creates a catfish Twitter account in order to ruin his own image, he sets off a series of events that will expose the dark sides of fame & obsession. I feel like I have to start off this section by saying that not only is this a 5 smiley face book, but it broke the smiley face scale. Luckily the last few books I’ve reviewed have been very good reads, but this is undoubtedly the best book I’ll read this year. The characters are incredibly well developed & interesting, the plot grips you from the first word & never lets you go, & the twists and turns not only make perfect sense, but actually surprise you. Lastly, I really have to commend A.V. Geiger on her talent as a writer. She is able to perfectly jump between the perspectives of Tessa & Eric, while making their characters feel distinct and interesting. She is also able to use the tool of flashbacks through police reports to help her story become even more compelling. Needless to say I am so excited to not only read the sequel to this book, but to also add A.V. Geiger to my list of auto-buy authors. I am so excited to see where her career goes, & encourage all of you to invest in this duology TODAY! All photos and information used in this blog belong to Sourcebooks Fire, Wattpad, Twitter, Goodreads, Instagram, Facebook, avgeinger.com, adam_jane, any and all producers, authors, publishers, and/or businesses that should receive credit for any book(s), mentioned in this blog post, all of the and all companies, individuals, corporations, managers, writers, producers, and/or businesses that should receive credit for anything mentioned in this blog post, and all original owners. I do not own anything in this blog. If any people, corporations, businesses, companies, etc, were not previously given credit for their work, they are given credit now and their previous absence was unintentional. All opinions expressed in this blog are my own. I wrote this blog for entertainment purposes and no copyright infringement is intended. celindareyesblog September 4, 2018 No Comments on Monday Memos: Book Review of Follow Me Back by A.V. Geiger. Category: Book Reviews, Monday Memos. Tagged: 2017, 2018, adam_jane, amazing, avgeinger.com, awesome, book, facebook, follow me back, Goodreads, instagram, mystery, psychological, review, Sourcebooks Fire, thriller, twitter, Wattpad, YA, young adult. Hello people of the internet!!! On today’s ‘YouTube Wednesday’ we’re going to discuss rising BookTuber/Lifestyle Guru ‘Basically Britt’. If you love channels that have really amazing, varied content then you gotta subscribe to this channel. Whether you like vlogs/book videos/or beauty & fashion videos you’ll find it all on `Basically Britt`. So now let’s get to why you’re here, the videos! Ready? Ok, let’s go!!! 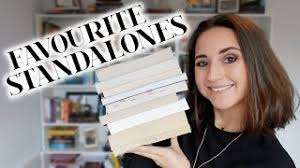 First up, we’re going to talk about is Britt’s ‘Best Books I’ve Read Because of BookTube’ video which was uploaded on March 26, 2016 (you can check out this video below). Now we’ve all been influenced by BookTube, Goodreads, or other reviews when it cones to books. If someone whose opinion you trust tells you that a book is good then that’s usually the next book you’ll pick up. Unfortunately sometimes this can lead to some not so great picks that add to your DNF (which means did not finish for those who don’t speak BookTube) pile. However, in this video we get to see some of the books that Britt was exposed to through BookTube that she ended up liking. It’s really fun when we get to see someone enjoying a book that they may have not known about without BookTube. The next video we’re going to discuss is her ‘MEETING KOALAS AND KANGAROOS | Backpacking Australia’ video, which was uploaded on November 16, 2017. This is such a cute vlog because we actually do get to see Koalas & Kangaroos! If you had to have a staycation this year (don’t worry I feel your pain), then this vlog will help you feel as if you did get to have exotic adventures this summer. Next up we have Britt’s ‘Books, Beauty, & Fashion | Try On Haul |’ which was uploaded on February 25, 2018 (you can check out the video here). In this video we get to see more diversity on Britt’s channel through the inclusion of beauty products & clothes! It’s so interesting whenever YouTubers branch out of their niches, so this definitely shows us that we can expect lots of different, cool videos from Britt in the future. The last video we’re going to talk about is her ‘ON MY SHELF #3’ video which was uploaded on August 20th, 2018. In this video Britt asked her viewers to pick random numbers, then she choose a shelf & book number on that shelf & talked about that book. It was definitely a fun game to watch because you got you see Britt discuss books she may not normally comment about. All photos and information used in this blog belong to Basically Britt, YouTube, Twitter, Goodreads, and all companies, individuals, corporations, managers, writers, producers, authors, publishers, and/or businesses that should receive credit for any book(s), mentioned in this blog post, all of the and all companies, individuals, corporations, managers, writers, producers, and/or businesses that should receive credit for anything mentioned in this blog post, and all original owners. I do not own anything in this blog. If any people, corporations, businesses, companies, etc, were not previously given credit for their work, they are given credit now and their previous absence was unintentional. All opinions expressed in this blog are my own. I wrote this blog for entertainment purposes and no copyright infringement is intended. celindareyesblog August 31, 2018 1 Comment on YouTube Wednesday: Basically Britt…the BookTuber you didn’t even know you needed in your life. Category: YouTube Wednesday. Tagged: Basically Britt, beauty, blog, blogger, booktube, fashion, Goodreads, haul, new, review, travel, twitter, youtube, youtuber. Hello people of the internet!!! 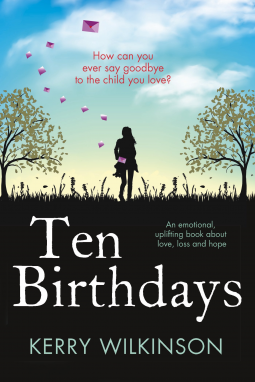 On today’s ‘Monday Memos’ we’re going to review a very interesting new book by author Kerry Wilkinson called ‘Ten Birthdays’, which was provided for review by Bookouture. 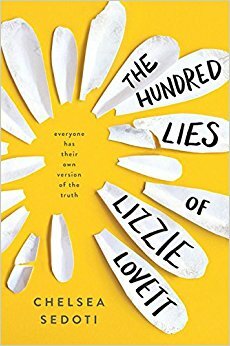 This book was released in May of 2017, and is a coming of age story about a British teenager. So let’s get to why you’re all here, the book review! Ready? Ok, let’s go!!! ‘Ten Birthdays’ follows the life of Poppy Kinsey as she evolves from a 16 year old teenager, into a 25 year old woman. On her birthday, Poppy receives one of 10 letters her mother wrote for her before her death on Poppy’s 15th birthday. At first Poppy is not sure if she wants to open the letters because it brings painful feelings to the forefront of her mind however, she eventually does read the 1st letter, and for the next 9 birthdays reads one letter a year. Throughout the story we see Poppy’s life change as she deals with friendships, relationships, and finding her purpose in life. Along the way poppy’s mother gives her life advice and tells her stories through the letters she wrote, and thus is able to stay a constant force in Poppy’s life. Although you would think that this story would be very sad, it is actually more of a coming of age story, than a story of loss. Anyone who has had someone close to them pass away can relate to Poppy’s mixed feelings of love and sadness in regards to the letters her mother left her. Also, I really enjoyed the fact that Poppy is not your stereotypical happy protagonist, and because of this faces struggles and consequences for questionable decisions throughout the course of the book. You find yourself constantly rooting for Poppy, and interested to know what the next year of her life will bring her. I also like that the book shows the difficulties Poppy and her two childhood best friends Mark & Freya face as they grow older and make decisions that determine who the kind of people they will grow up to be. Lastly, although there is not a lot of diversity in this book, Freya is bi-racial (her mother is Jamaican and although the book does not actually describe her father, it does allude to the fact that he is white). Because of all of these factors, I would definitely give this book a 4 smiley face rating. It is a very enjoyable novel that you will not want to put down, and I definitely hope that we will get a sequel one day because I would love to continue to see how these amazing charterers’ lives turn out. All photos and information used in this blog belong to Kerry Wilkinson, kerrywilkinson.com, Goodreads, Twitter, YouTube, Instagram, Bookouture all companies, individuals, corporations, managers, writers, producers, authors, publishers, and/or businesses that should receive credit for any book(s), mentioned in this blog post, all of the and all companies, individuals, corporations, managers, writers, producers, and/or businesses that should receive credit for anything mentioned in this blog post, and all original owners. I do not own anything in this blog. If any people, corporations, businesses, companies, etc, were not previously given credit for their work, they are given credit now and their previous absence was unintentional. All opinions expressed in this blog are my own. I wrote this blog for entertainment purposes and no copyright infringement is intended. celindareyesblog July 30, 2018 No Comments on Monday Memos: Book Review of ‘Ten Birthdays’ by Kerry Wilkinson. Category: Book Reviews, Monday Memos. Tagged: 2017, 2018, book, Bookouture, coming of age, friendship, Goodreads, instagram, Kerry Wilkinson, kerrywilkinson.com, new, review, romance, summer, ten birthdays, twitter, YA, young adult, youtube. Hello people of the internet!!! 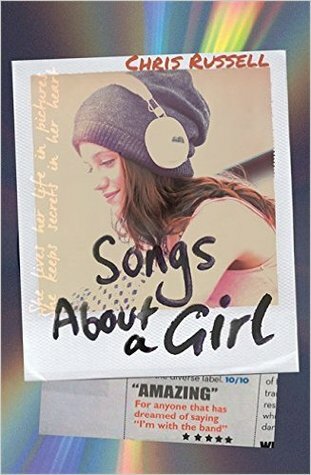 On today’s ‘Monday Memos’ we have a book review of the first book in a new series called ‘Songs About a Girl’ by Chris Russell. This book was provided for review by Flatiron Books (a division of Macmillan Publishers), and was released on July 28th, 2016. Just so y’all know this will be a spoiler-free review so let’s get to the fun part of this blog, the book! Ready? Ok, let’s go!!! This is a story about a 15 year old girl named Charlie who is given the opportunity to photograph the biggest pop band in the world Fire&Lights. Although Charlie is a quiet, shy girl, she is quickly is pushed into the spotlight after a photo of her with one of the guys from the band is leaked. At 1st Charlie decides to distances herself from the band, but when she finds a connection between their new lead single and poetry in her deceased mother’s old journal she can’t ignore investigating a possible connection. The harder Charlie looks for answers about her own past, the more she experiences the dark side of fame and fandom. I’m going to start off by saying that the premise of this book was super interesting. We live in a time where reality & gossip shows allow us to feel closer to our favorite stars than even before. Also, with the addition of social media we’re able to join fandoms & feel a community around our admiration. Although ‘Songs About a Girl’ is marketed (rightfully so) as a One Direction fan-fiction, it really does speak to the current celebrity-centric culture we all live in. Although this isn’t a new topic, I really liked the way Chris Russell showed his love for fandoms in this story, but also showed the consequences of what can happen when they cross the line. I also really liked the characters he created. Charlie is a relatable protagonist, her bff Melissa is the fangirl in us all, the guys in the band are interesting and fun to read about, even the “villains” & more minor characters serve their roles well. The problem however, lies in how all of this comes together. In the end this story is a One Direction fan-fiction at its core which can either be a good thing or a not do good thing. If you really like romance & One Direction then you’ll probably love this book, but only if you really really love both of those things. Personally I’m a fan of both but this story just didn’t click with me. The whole time I kept getting distracted by who inspired which character and it took me out of the story too much. The big twist was very predictable (and I’m horrible at predicting this stuff so that tells you a lot), and the love triangle was solved to quickly (I know, I know, a lot of us have asked for this but a little more tension is always nice). Also, the mystery surrounding Charlie’s mom felt unnecessary & ultimately seemed like it could potential get in the way of the romance between her & the guy she chooses at the end of the book. I feel like this book serves a very niche market which isn’t necessarily a bad thing, but because of this forces me to give it 2 smiley faces. This is definitely a quick, light summer read that you can try out if it sounds interesting, but because it doesn’t have a very vast market appeal I can’t recommend it for everyone. However if you do read it & love it, then book 2 is already out, and book 3 will be released later this year! All photos and information used in this blog belong to Chris Russell, chrisrussellwrites.com, Twitter, Facebook, Instagram, YouTube, Flatiron Books, Macmillan Publishers, and all other publishers, and/or businesses that should receive credit for any book(s), mentioned in this blog post, all of the and all companies, individuals, corporations, managers, writers, producers, and/or businesses that should receive credit for anything mentioned in this blog post, and all original owners. I do not own anything in this blog. If any people, corporations, businesses, companies, etc, were not previously given credit for their work, they are given credit now and their previous absence was unintentional. All opinions expressed in this blog are my own. I wrote this blog for entertainment purposes and no copyright infringement is intended. celindareyesblog July 24, 2018 1 Comment on Monday Memos: Book Review of ‘Songs About a Girl’ by Chris Russell. Category: Book Reviews, Monday Memos. Tagged: •Chris Russell, 2016, 2017, 2018, book, boyband, Chris Russell, chrisrussellwrites.com, facebook, fanfiction, Flatiron Books, instagram, Macmillan Publishers, music, new, one dirction, one direction, Release, review, songs about a girl, trilogy, twitter, YA, young adult, youtube. “There was something so tragic about the acts of desperate girls. My helpless heart wished that I could write a different ending to the story, that I could have kept Chloe from disappearing and delivered Helen safely home. But trusting the wrong person wasn’t the only kind of desperate act. Wishing for the impossible could break you just as swiftly.Whether you wanted someone to love you or someone to protect you, it was hard to be a girl in need.” – Jenny Parker ‘The Lives of Desperate Girls’. Hello people of the internet!!! On today’s ‘Monday Memos’ we’re going to review a Young Adult mystery book entitled ‘The Lives of Desperate Girls’ by Canadian author MacKenzie Common. 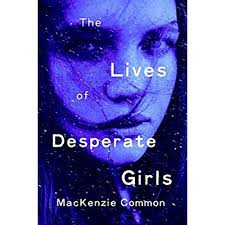 ‘The Lives of Desperate Girls’ is MacKenzie Common’s debut book, and this copy was provided for review by Penguin Random House Canada. 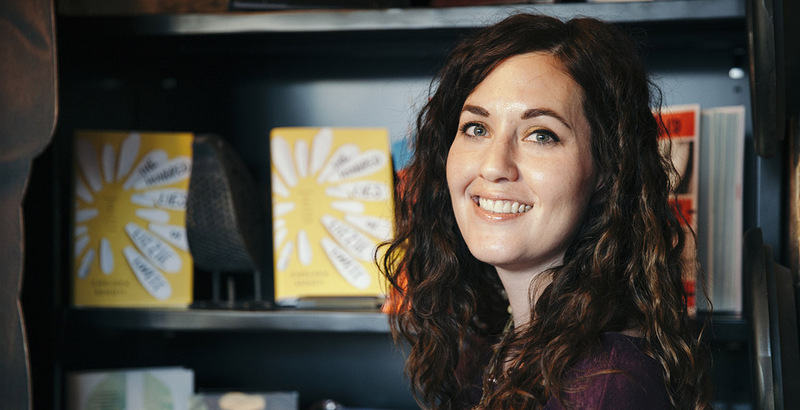 MacKenzie Common is an author who is originally from Newfoundland but grew up in Northern Ontario. I do need to add a trigger warning due the sexual assault that is present in this novel. There’s a lot we have to discuss about this book, but keep in mind that this will be a spoiler-free review so let’s get into it. Ready? Ok, let’s go!!! ‘The Lives of Desperate Girl’s centers around high school junior Jenny in the aftermath of the disappearance of her best friend Chloe. Jenny has always felt inferior to her friend due to Chloe’s wealth, popularity, and ease in social situations, in contrast to Jenny who is the exact opposite in all of these areas. Jenny has a hard time adjusting to life without Chloe, which is made more difficult when a local Indigenous girl named Helen is found murdered. Jenny soon begins to investigate Helen’s murder with a classmate named Tom, who has a reputation of being a loner in school. As Jenny finds out more about who Helen was as a person, she also learn more about her country’s history with racism, as well as the racism that still lingers to this day. Although Jenny is very dedicated to finding out who killed Helen and if this has anything to do with Chloe’s disappearance, she struggles with a big secret that she and Chloe have tried to keep buried for nearly a year. Now we’ve arrived to the question of whether you should invest in this book or not. I will start this off by saying that I had to give this book 1 smiley face because it had a lot of problems. One aspect of the book that I didn’t enjoy was the romance between Jenny and Tom. I definitely felt that their romance escalated quickly and then towards the end of the book his character became less and less important to the story so the romance seemed pointless. The mystery aspect of the book also lacked that element of immersion that made you feel that you were never really invested in the story. One positive aspect was the representation of Indigenous people due to the various Indigenous characters we saw throughout the story. I will say that this book does contain sexual assault as well as very strong language that is not appropriate for all ages so if this is trigger or offensive to you I would skip this one. All in all this book felt like it tried to tackle so many topics at once and because of this was stretched too thin to accomplish what it set out to do. All photos and information used in this blog belong to MacKenzie Common, Goodreads, penguinrandomhouse.com, Penguin Random House Canada, all companies, individuals, corporations, managers, writers, producers, authors, publishers, and/or businesses that should receive credit for any book(s), mentioned in this blog post, all of the and all companies, individuals, corporations, managers, writers, producers, and/or businesses that should receive credit for anything mentioned in this blog post, and all original owners. I do not own anything in this blog. If any people, corporations, businesses, companies, etc, were not previously given credit for their work, they are given credit now and their previous absence was unintentional. All opinions expressed in this blog are my own. I wrote this blog for entertainment purposes and no copyright infringement is intended. celindareyesblog July 9, 2018 No Comments on Monday Memos: Book Review of ‘The Lives of Desperate Girls’. Category: Book Reviews, Monday Memos. Tagged: 2018, books, Goodreads, MacKenzie Common, new, Penguin Random House Canada, penguinrandomhouse.com, review, the lives of desperate girls, YA, young adult. Hello people of the internet!!! 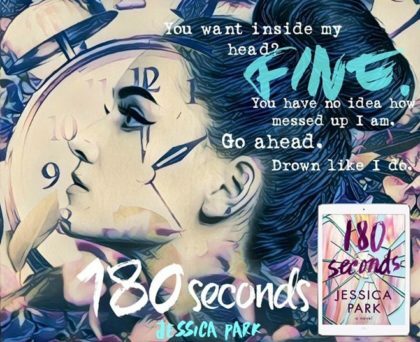 On today’s ‘Monday Memos’ we’re going to discuss a new book by author Jessica Park called ‘180 Seconds’, which was provided by ‘Skyscape’ and ‘Two Lions’ for review. Jessica Park grew up in the Boston area and attended Macalester College in St. Paul, Minnesota. She has also previously written several books entitled ‘Clear, ‘Relatively Famous’, as well as the series ‘Left Drowning’ and ‘Flat-out Love’. This review will be spoiler free, so if you’re ready let’s find out whether you should add this book to your summer TBR or if 180 seconds of your time is more than this book deserves. Ready? Ok, let’s go!!! ‘180 Seconds’ is about a college junior named Allison who lived within the foster care system until she was adopted at the age of 15. Due to what she experienced as a child, Allison is not comfortable forming strong bonds with people, which includes her adoptive father Simon. The only person that Allison feels truly close to is her childhood best friend Steffi. All of this begins to change when Allison unwillingly participates in a social experiment conducted by social media star Esben Baylor. The 180 seconds that this experiment takes sends Allison on a path to discover what love and friendship mean to her, as well as the realization that sometimes the strongest people hide the darkest demons. Personally I really loved this book as a whole. Immediately we are introduced to a cast of interesting characters that show new layers the further into the story you go. Allison is a relatable, interesting protagonist that we see tremendous growth from throughout the course of the novel. Esben is also an interesting character that at first glance appears to be the stereotypical perfect love interest, but is later shown to have much more to him. However one of my favorite characters had to be Allison’s adoptive father Simon. He is our diverse character in ‘180 Seconds due to the fact that he is gay however, Jessica Park does an amazing job to show that Simon is also fun, funny, and above all an amazing father (seriously this guy has a superhuman amount of patience). Although I did thoroughly enjoy this book, there were a few places here and there where the book lagged a bit and I felt myself skimming the pages a bit until the story picked up again. Although this didn’t happen often, I did have to knock my rating down from 5 to 4 smiley faces because of this. Also, this book does mention sexual assault twice in reference to two of the characters’ backstories so if you are triggered by this please proceed with caution. In conclusion I would say that this book is definitely worth the read due to its interesting mix of fun romance and deep emotional topics. All photos and information used in this blog belong to Twitter, Jessica Park, netgalley.net, jessicapark.me, Facebook, Goodreads, Skyscape, Two Lions, all companies, individuals, corporations, managers, writers, producers, authors, publishers, and/or businesses that should receive credit for any book(s), mentioned in this blog post, all of the and all companies, individuals, corporations, managers, writers, producers, and/or businesses that should receive credit for anything mentioned in this blog post, and all original owners. I do not own anything in this blog. If any people, corporations, businesses, companies, etc, were not previously given credit for their work, they are given credit now and their previous absence was unintentional. All opinions expressed in this blog are my own. I wrote this blog for entertainment purposes and no copyright infringement is intended. celindareyesblog July 2, 2018 1 Comment on Monday Memos: Book Review of ‘180 Seconds’ by Jessica Park. Category: Book Reviews, Monday Memos. Tagged: 180 seconds, 2018, books, facebook, Goodreads, jessica park, jessicapark.me, netgalley.net, new, review, Skyscape, twitter, Two Lions, YA, young adult. “She took my heart and held it safe. She promised to wait for me, with words that echo in my mind and tender touches that I can still feel on my skin”– Corey from ‘Before I Let Go”. Hello people of the internet!!! On today’s ‘Monday Memos’ we’re going to review a new book by New York Times Bestselling Author Marieke Nijkamp. You may recognize Marlene’s name due to the popularity of her 2016 debut book ‘This Is Where It Ends’, as well as the editor of the anthology Unbroken: 13 Stories Starting Disabled Teens which will be released in the fall of 2018. Today we have the privilege of reviewing her latest book ‘Before I Let Go’, which was released on January 2, 2018 and was provided for review by Sourcebooks Fire. This will be a spoiler free review however I will discuss how the ending affected my opinion of the book. So now let’s get to the review. Ready? Ok, let’s go!!! 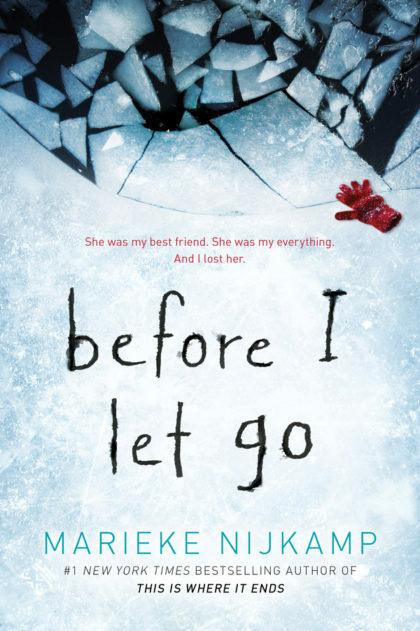 ‘Before I Let Go’ is a Young Adult suspense novel surrounding the suicide of a bi-polar young teenage girl name Kyra in the small town of Lost, Alaska. When Kyra’s best friend Corey returns to Lost after moving away for several months, she begins to realize that the town is very different than she remembered. Corey is shocked to find that she is now treated like an outsider by people who have known her for her entire life, and feels that there is an aura of secrecy surrounding the town. However the thing that Corey finds the most shocking is the fact that everyone in town speaks very highly and lovingly of Kyra, despite the fact that Corey always saw that everyone in town mercilessly tease and abused Kyra her entire life. Corey begins to suspect that there is more to Kyra’s death than what she has been lead to believe, so she decides to investigate the story herself. Throughout the story Corey finds out dark secrets about the town and herself that she had never considered before. Corey also finds that she has enemies and allies in the town that will play an important role in uncovering the truth. So now we’ve reached the point in the review where I tell y’all if you should buy this book or not. Honestly, this book is a little difficult to recommend because it was a solid 5 star read until I reached the ending of the book. Now this book does have some problems throughout, such as the fact that Corey is not a very likeable protagonist because of the way she treated Kyra after she moved (which is made even worst by how mentally ill Kyra is, and the fact that Corey knows this but still treats her this way). The book also contains several pages where the writing suddenly changes to a script style (like a play would have) which was really jarring and completely unnecessary to the story because it didn’t tie in with anything. However a positive point of this book is that we do get to see a lot of diversity with the inclusion of asexual, pansexual, and homosexual characters, as well as a very detailed accounting of Kyra’s mental illness that helps us really understand and fall in love with her character. The author truly does an amazing job of pulling you into the mystery of Lost and keeping you engaged throughout every twist & turn that comes our way. Unfortunately this is all ruined by the ending of the book. As soon as Corey solves the mystery we reach the climax of the book and then the story just ends. It does not resolve, it just ends. After all of the build up and great storytelling that the author does, this ending is just so disappointing that it honestly ruined the whole experience of the book for me. Because of this, I have to give this book a solid 2.5 smiley faces out of 5, which truly saddens me to do because this story deserved so much more. All photos and information used in this blog belong to Marieke Nijkamp, Sourcebooks Fire, Twitter, Instagram, netgalley.net, marikekenijkamp.com, all companies, individuals, corporations, managers, writers, producers, authors, publishers, and/or businesses that should receive credit for any book(s), mentioned in this blog post, all of the and all companies, individuals, corporations, managers, writers, producers, and/or businesses that should receive credit for anything mentioned in this blog post, and all original owners. I do not own anything in this blog. If any people, corporations, businesses, companies, etc, were not previously given credit for their work, they are given credit now and their previous absence was unintentional. All opinions expressed in this blog are my own. I wrote this blog for entertainment purposes and no copyright infringement is intended. celindareyesblog June 25, 2018 1 Comment on Monday Memos: Book Review of ‘Before I Let Go’ by Marieke Nijkamp. Category: Book Reviews, Monday Memos. Tagged: 2018, Asexual, book, Diversity, fiction, instagram, LGBTQ, Marieke Nijkamp, marikekenijkamp.com, mytery, netgalley, netgalley.net, new, Pansexual, Pride, review, Sourcebooks Fire, twitter, YA, young adult.